US Snipers Vs European Snipers: Sniping from Helicopter, Boat and Ground ! Footage of the 2016 EBSSC sniper competition. A total of 15 teams (U.S. Army, U.S. Marines and numerous European countries like Sweden, Belgium, Spain, etc...) strive for the title of the Best Sniper Squad. The Norwegian squad won this competition. Who are the BEST snipers of the USA? A short Clip with Pictures and Archive Footage showing Soviet Snipers of World War II. Here's an interesting vid about what it takes to actually be a sniper. We will discuss the history of the gun, and the various elements of its design. Is it really the best sniper rifle ever? Well...it is a really magnificent gun, but exhibits a number of antiquated features by today's standards - like not having a free floated barrel. We will disassemble it (no simple task!) and then take it out to the range. With the British military's return to Afghanistan in the Global War on Terror, it was found that the very long engagement ranges made it necessary to have a 7.62mm designated marksman's rifle, in addition to the 5.56mm scoped rifles in service. This was not unique to the British military; the US came to the same conclusion and addressed it by reissuing M14 rifles in new stock systems. The British, however, put out a tender for a new 7.62mm rifle in 2009 (the FAL being not sufficiently accurate to meet this need). The final contenders for the role were the H&K 417 and the Lewis Machine & Tool LM7 rifle - basically a Stoner SR25 or AR-10 using the original Stoner quasi-direct-impingement action. LMT was chosen as the winner and formally adopted as the L129A1 in October of 2009, with rifles entering field service by May of 2010. The L129A1 has proven effective and popular enough that the British military is currently looking to expend its role to that of sniper support weapon. This would involve a change in anticipated targets to enemies wearing body armor, which the current 7.62mm projectiles are not particularly good at defeating. A new projectile is in development with a steel penetrator tip (in principle similar to the 5.56mm SS109 projectile) to allow the L129A1 to fill this new role as well. Developed in the 1980s, the H&K PSG-1 is one of the most iconic sniper rifles in popular culture, with a reputation for unmatched accuracy. It is, in fact, an excellent rifle, and today we will look at why. The PSG-1 was introduced in the 1980s and based on the German G3 rifle action. Onto this base, a heavy barrel was added, and stiffening bars welded to the sides of the receiver. A Hensoldt 6x42mm scope was added, with proprietary mounting points welded to the receiver. An adjustable buttstock was added (common today, but much more innovative at the time) allowing the shooter to change the comb height and length of pull. An excellent 3lb crisp trigger replaced the standard heavy and mushy G3 trigger. A forward assist was installed to allow for quiet closing of the bolt, and the extractor and locking rollers were redesigned. All of these changed made for a very accurate and very expensive rifle, and one which would find its way into popular culture as one of the ultimate sniper rifles ever made. Perhaps surprisingly, it does actually live up to much of this hype, and is legitimately an excellent rifle - although intended more for police use than military. U.S. Marine and Japan Ground Self-Defense Force scout snipers shoot a range during exercise Forest Light at Somagahara, Japan on March 10, 2017. The Marines are with Company G, 2nd Battalion, 3rd Marine Regiment, 3rd Marine Division, III Marine Expeditionary Force. By popular request, Rex reviews the top reads on the topic of long range shooting, ballistics, and the tactical application of precision rifle fire in real life. Enjoy! Snipers, hunters, target shooters, ladies and gentlemen... Finally, Rex Reviews releases this long awaited free online long range shooting / sniper tutorial. TiborasaurusRex will walk you through everything you will need to know about sniper ammunition and cartridge selection, rifle and equipment options, basic and advanced external ballistics, making effective ballistic charts, rangefinders and distance determination, long range marksmanship, shooter / spotter team dynamics and communication, choosing a FFP, making the shot, spotting the shot, and much more. This course goes far beyond what is covered in the U.S. Army FM23-10. So, if you can't make it to Quantico or the AMTU to learn these long range shooting skills, this video tutorial series will have you covered. We will get you set up to make amazingly accurate first round shots at 1 mile and beyond. Do you want to be able to zap that white tail buck at 1,275 yards and be confident it will be a nice clean kill? Watch this series! All law abiding men and women in the free world who treasure their rifles MUST have these long range shooting skills for the continuation of our shooting culture and for the future preservation of our wonderful nation! Peace is beautiful, insure it by sharing these marksmanship skills with your friends and families to exponentially increase our nations already robust defense stature against. Stay clean, obey the law, and keep smiling. All of the music and photography in this film was created by TiborasaurusRex, an unsigned artist. Psalms 144:1 written by: King David (back in the day) Read the Bible, its awesome. This video looks at women serving in the Soviet military during World War II. Many women who saw their villages emptied of husbands, sons, and fathers who would never again return home, decided to enlist to fight back Nazi invasion. While the vast majority of these brave women would become nurses or would engage in support roles, there were exceptions who would directly engage in combat as pilots or even snipers. Two such snipers were the renowned Lyudmila Pavlichenko and Nina Petrova. These exceptional women would win equivalent honors as the American 'Medals of Honor' and the world would hear of their bravery and combat effectiveness. Pavlichenko would kill 309 Nazi soldiers, 36 of whom were snipers. Petrova's confirmed kills would weigh in at 122, and she would add to her achievements a list of 500 snipers she personally trained. Despite the very difficult physical demands of combat, and the sociological hurdles which make it very hard for women to serve on the front lines, these warrior poets garnered the respect of all. I'll just throw this in. I Larp sometimes. That is, essentially, dungeons and Dragons as adults dressed in medieval clothes/armour running about hitting each other with foam swords. It's therapeutic ... trust me. Well I'm not really one for the running and hitting bit ... so I play an archer. I will tell you .. even just armed with a 25lb bow and foam tipped arrows ... snipers are holy on the battle field. Feared as the hand of Gawd himself. I've personally held off a dozen guys in armour with one arrow. No idea how it worked, but I totally stalled a flanking attack just by standing there with bow drawn. Of course, they then realized what they were doing and charged, but by then my backup had arrived and they got smashed. The ability of your enemy to reach out from a distance and swat you down is a religious experience. Never underestimate it. International snipers engage targets during the European Best Sniper Squad Competition at the 7th Army Training Command’s Grafenwoehr Training Area, Bavaria, Germany, Oct. 23-27, 2016. The European Best Sniper Squad Competition is an Army Europe competition challenging militaries from across Europe to compete and enhance teamwork with Allies and partner nations. The Best Squad Competition includes competitors from Belgium, Denmark, Italy, Latvia, Lithuania, the Netherlands, Norway, Spain, Sweden, the United Kingdom and the United States. The four-day competition, with approximately 30 events, will test multinational sniper squads on land navigation, advanced marksmanship, medical simulations and more. The Best Squad Competition is designed to project a dynamic presence, foster military partnership and promote NATO and partner nation interoperability. Hit at over 2 miles! Pure luck or skill? Rex delivers expert scientific analysis of this historic record shot! According to media reports, a Canadian sniper set what appears to be a new record, picking off an enemy Kahlua-fudgebar fighter from 2.2 miles away using his McMillan Tac-50 with Schmidt and Bender PMII scope. What would a shot at over 2 miles look like? Rex and Colin Burns discuss the firing solution in full detail! PLEASE SHARE! ATTENTION: Engineers, Long Range Rifleman, Snipers, and Applied Physics Enthusiasts! Meet us in Dallas (July 28-30, 2017) for the RX17 Long Range Precision Rifle Class! This may be our last class in this format - an ultimate download of Master's Level knowledge awaits you! Hang out with Rex and crew! Break bread with us and share stories! Cost of tuition will save you thousands of dollars and will accelerate you decades into the future in terms of observational experience! TICKETS AVAILABLE NOW!!! Photo taken in Germany, May 4, 1945. First row – Guard Staff Sergeant, VN Stepanov: 20 kills, Guard Sgt JP Belousov: 80 kills, Guard Sgt AE Vinogradov: 83 kills. Third row – Guard Lieutenant NP Belobrova: 70 kills, Lieutenant N. Lobkovsky: 89 kills, Guard Lieutenant VI Artamonov: 89 kills, Guard Staff Sergeant MG Zubchenko: 83 kills. Forth row – Guard Sergeant, NP Obukhov: 64 kills, Guard Sergeant, AR Belyakov 24 kills. Total number of confirmed kills: 775. Because of chronic problems in finding the manpower to fulfill military and industrial tasks, the Soviet government recruited some 7.75 million women, of whom 800,000 served in the military. Sniping was a precision role, which many women soldiers performed with expertise. 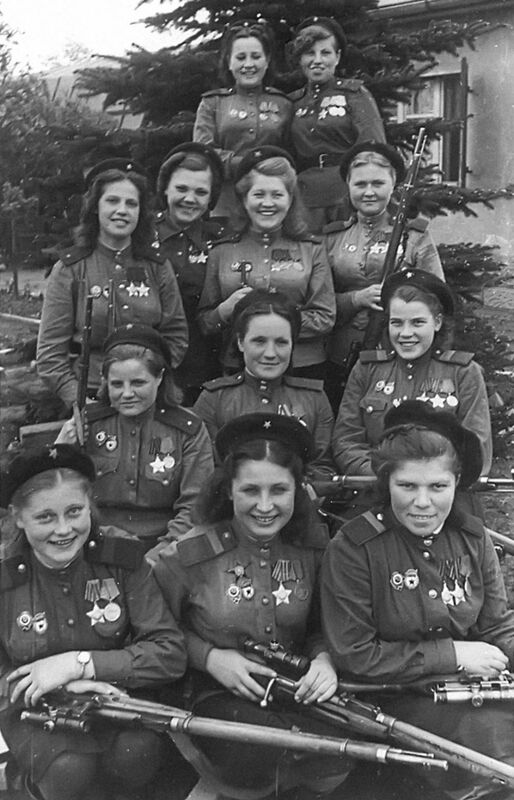 It is estimated that in 1943 there were more than 2,000 female snipers in the Soviet armed forces. Female snipers have been credited with more than 12,000 confirmed kills. The Soviet Union used women for sniping duties extensively, and to great effect, including Nina Alexeyevna Lobkovskaya and Ukrainian Lyudmila Pavlichenko (who killed over 300 enemy soldiers). The Soviets found that sniper duties fit women well, since good snipers are patient, careful, deliberate, can avoid hand-to-hand combat, and need higher levels of aerobic conditioning than other troops. Women were regarded as having the skills and nerves required for accurate marksmanship. Notwithstanding male skepticism, Major General Morozov, “the father of the sniper movement”, attributed superior female marksmanship to the fact that “a woman’s hand is more sensitive than is a man’s. Therefore when a woman is shooting, her index finger pulls the trigger more smoothly and purposefully”. The most successful Soviet use of snipers during the Second World War was during their defensive stage of the war (1941–1943), after which the advantage of defense shifted to the German side and German snipers became a real danger to the advancing Soviets. Soviet military doctrine used snipers for providing long-distance suppressive fire and for eliminating targets of opportunity, especially leaders, because during World War II, Soviet military leaders and combat theorists found that military organizations had difficulty replacing experienced non-commissioned officers and field officers during times of war. They also found that the more expensive and less rugged sniper rifles could match the cost-effectiveness of a cheaper assault rifle given good personnel selection, training, and adherence to doctrine. SFC Matt Hammond, NCOIC for the US Army Sniper School, discusses details of the 2017 International Sniper Competition. Find out what the competition is all about and how to come out and watch the best sniper in the world in action. During WWII Japan, like many nations, fielded a couple of different sniper rifles. There's no denying that such firearms in the hands of competent users can be quite effective. In this episode we take a look at a Nagoya Type 99 Arisaka sniper rifle chambered in 7.7x58mm JAP. Over the last several episodes, Patrick has shown you how the Ritter & Stark SX-1 is made, what is coming next, and what inspired the level of detail that Ritter& Stark has put into the SX-1. The SX-1 has an impressive set of features that allow a shooter to quickly change from .308 Winchester to .300 Win Mag to .338 Lapua Mag without re-zeroing your scope since the scope mount is attached to the removable barrel. They are currently in stock at EuroOptic and start at about $5500 and go up depending on options. Big thanks to my friend Justin for enduring the muzzle blast to spot for me. Born and raised in Macon, Georgia, Charlie joined the U.S. Navy at the age of 19. He completed the Basic Underwater Demolition/SEAL course Class 176 and checked into his very first SEAL Team, (SEAL Delivery Vehicle Team-2) where he underwent 3 deployments, and eventually served as a SEAL Delivery Vehicle Instructor. Runner Up for PACIFIC-FLEET SOY. Check out www.rexreviews.org for our FREE PODCAST feed and TRAINING schedule! This week at Tactical Rifleman we had the opportunity to spend some time with our friend David Ives from Nemesis Arms, and his very impressive creation, the Valkyrie ambidextrous precision rifle. You can find them online at nemesisarms.com You may have seen a glimpse of the Valkyrie in a few popular movies and television shows such as; The Bourne Legacy, Person of Interest, and Marvel's Agents of S.H.I.E.L.D, just to name a few. The Valkyrie is also currently serving with several U.S. and Allied SOF forces on the frontlines around the globe. As the Chief Engineer, President and Owner of Nemesis Arms, David described to us, how he set out to create and engineer the first ever purpose-built fully ambidextrous, multi-caliber, take down precision rifle system. David told us he achieved his primary design goal by engineering and machining the Valkyrie receivers; in house at his facility in Park City Kentucky, to accept both a right and left hand bolt. When the Tactical Rifleman team got behind the rifle we found that the bolt exchange was achieved extremely rapidly and required absolutely no tools! You simply depress a single bolt release detent button, remove one bolt and swap if for the other. In addition, all of the fire controls and magazine release are designed around the receiver center-line so they can be manipulated with either hand from both sides of the weapon system. The ingenious tool-less design is carried throughout the weapons system as you can see in the video. The ambidextrous, multi-caliber, take down conceal-ability, and portability of this type of weapons system is very attractive to SOF forces; because for them this means less cost for the units, both in procurement and employment. It reduces the cost of purchasing and shipping both left and right handed precision rifles to deployed units. To the trained operator these features allow the Valkyrie to be employed in a multitude of different mission parameters, in addition the ambidextrous design provides the operator the flexibility to achieve a more covered and/or concealed firing position during the mission. This can directly translate into the operator's increased survivability and mission success! The multi-caliber options of the Valkyrie allow it to be tailored to specific mission requirements. The Valkyrie's proprietary return-to-zero, tool-less take down chassis technology and 11 pound overall weight showcases its conceal-ability, portability, and versatility. Throughout the course of the day at the T1G facility the Tactical Rifleman team assembled and disassembled the Valkyrie at least six times and the weapon returned to zero every time and continuously delivered a high degree of accuracy! If you have the opportunity to get behind and shoot a Valkyrie we highly recommend it! Again thanks for watching! Strength & Honor, KG. Ukraine Today's partner news agency TSN goes undercover to meet the snipers training to become Ukraine's deadliest men. The servicemen hope that their contribution can be decisive, as the Ukrainian military continues to fight Russian-backed militants in the east of the country. The enemy should be afraid - a warning from a top Ukrainian commander. These National Guard troops are on a firing range, testing new rifles. These weapons are advanced compared to equipment currently used by the military in eastern Ukraine. For example, the rifles have advanced scopes with an option of a thermal or laser telescopic sight – ideal for round the clock operations. Perhaps most importantly though – the majority come with the label ‘Made in Ukraine' – something the military leadership hope to see more of in the future. Oleksandr Turchynov, Ukraine's National Security and Defence Council Secretary: "We have set targets for our (weapons) producers to be a world class example and step-by-step, gradually abandon Soviet weapons and move towards Ukrainian-made ones." The new weapons have a firing range of up to 1,200 meters, weight around 4.5kg and use 7.62 caliber cartridges. The trials were watched on by Oleksandr Turchynov, Ukraine's National Security and Defence Council Secretary. He announced the establishment of a new ammunition production plant. PART IV - Weapons: Everything about Ukrainian sniper rifles. The fourth episode explores the development of the high-precision weapons designed to kill and destroy. If you're not already a member, go to http://www.audible.com/demoranch for a free 30 day trial. Download The Reaper by Nicholas Irving to get a glimpse of what he went through while fighting overseas. So, once a “Running Disposable” breaks down, at T1G, the driving instructors turn it into a “target car.” As no one was using the driving track that day, the driving instructors were nice enough to let us pop a couple of caps at this car. Shooting cars is fun but, just like everything else, I always like to turn it into a teaching opportunity. As I mention in the video, they are lots of specialty rounds out there for penetrating different kinds of barriers, such as glass. However, with every new type of round in your rucksack, you now have to also have accurate data for each type of round. While some units need these specialty round, because of their “specialty” missions (such as commercial aircraft or embassy windows; most military units do not need specialty ammo. Shooting through glass is a common task for snipers. We will cover shooting through building glass in an upcoming future video. However, this week, I wanted to focus on shooting through standard vehicle glass. It seems like every Clancy book or Hollywood movie requires the hero sniper to make special calculations when shooting through glass. That makes for great entertainment for an audience that thinks it really is educated. For this video we use the standard US issue M118LR 7.62x51mm 175gr Sierra Matchking. We are shooting it from a Nemesis Arms Valkyrie take-down rifle, because it is fun to shoot; but the outcome of our tests would have been the same no matter what weapon was used. Please note that we are shooting into the vehicle, with the glass within a few feet of the target. We are NOT shooting through glass with the glass NEAR the sniper. Anything (including grass & tree branches) can deflect the bullet if it is near the front of the gun. You won't even find the bullet. Bottom Line: When shooting through glass, with your target within 10ft of the glass; just shoot TRUE Point of Aim / Point of Impact. 375 Cheytac at nearly 1 mile! Plinking some medium ranges with the 16" Desert Tech SRS Covert topped with Nikon Black X1000 4-16x MOA. This little guy drives tacks. A technical review of the L129A1 British Sharpshooter Rifle. 16inch 308 at 1,200 Yards?! Impossible!!! Rifle details in top 2 4AW comments in the comments section of video.